The physiology research stream aims to better understanding the physiological mechanisms and effects of laparoscopic adjustable gastric banding (LAGB). Our principle focus is on defining physiological events at the gastro-oesophageal junction that are inducing weight loss. Currently, we are systematically evaluating peripheral physiological processes and intra-luminal events associated with the activation of satiety in LAGB patients. These are being correlated with the hormonal response to food intake that leads to reduced overall caloric intake and signals meal termination. The short term goals of the physiological research stream include: Translating research findings to patient benefits through dissemination of research findings, education of physicians, production of patient education materials, implementation of optimised follow up and adjustment schedules and the creation of specific diagnostic tests for symptomatic patients. 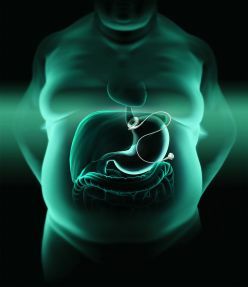 Longer term goals involve developing strategies to improve weight loss and reduce risk of complications such as luminal dilatation through utilising improved physiological understanding of the procedure and better defining the specific mechanism by which the peripheral satiety mechanism is activated thereby linking to improved future therapies. Essentially, how do we switch off appetite and induce weight loss. This represents a key goal of the program. The current program, commencing in 2011, represents a focused extension based on our recent discoveries concerning the physiological effects of LAGB. We are studying the role of oesophagogastric junction compliance, sensory feedback and supra-band gastric accommodation in satiety and the role that gastro-intestinal hormone release plays in combination with supra-band gastric accommodation. How LAGB is able to lower the sensory threshold necessary for the induction of satiety is central to these endeavours. Other ongoing projects include developing better diagnostic tests for symptomatic patients and defining the anti-reflux mechanism of the gastric band. The latter will involved a randomised control trial demonstrating the efficacy of LAGB in comparison to conventional therapies. Our unique capacity to evaluate physiological and anatomical events at the oesophagogastric junction optimally places us to investigate the use of new and novel endoscopic devices.